The act of shaving with a straight razor is an art all in itself. The nostalgic shaving method is used by men as a cool method of getting a very close shave. That being said, your shave is only as good as the razor you are using. It’s important to keep that blade as sharp as possible. While it may seem daunting at first, sharpening a razor will become second nature with a bit of practice. In fact, it’s what makes using a straight razor fun! There’s something unique and rugged about sharpening a blade that you’re about to run across your face. Not only is it enjoyable, but it helps to keep the blade pristine and your face free of irritation. Do You Even Need To Sharpen The Blade? This is often the first mistake guys make. It’s important to be in tune with the razor. You need to be able to recognize the sharpness of the blade before you even start shaving. Otherwise, you’ll be left with irritation rather than a smooth face. While the blade may seem sharp at first, it may need to be honed to be effective. This comes with experience. Over time, guys will be able to recognize the blade’s sharpness as they become more comfortable with it. In the meantime, there are a few ways to test a blade’s sharpness. Shave. There’s no better way to determine a blade’s sharpness than shaving. That being said, it’s always good to start with a small patch. Simply running the blade through a small portion of the skin will help give you an understanding on how sharp it is. If the blade pulls at the hair or doesn’t provide a close shave, it’s time for honing. A sharpened blade should just glide over the face, removing hair as it goes. A blade that pulls hair indicates that there may be some inconsistencies in the metal. On the other hand, the blade may not remove hair at all or causes irritation on the skin. If this is the case, the blade is too sharp. These little nuances will become more apparent as you get more comfortable with the blade. Cutting a Single Hair or Paper. A sharp blade will cut through hair or paper like butter. You can easily tell how sharp a blade is by simply cutting through a single piece of hair. After plucking out a piece of head hair, hold the razor stationary and guide the hair towards it. If the hair slices with no resistance, the blade is sharp. However, if the hair tears or catches on the blade, it needs honing. The same can be done with a piece of paper if you don’t want to rip out a hair from your head. A sharp blade will slice through the paper better than any pair of scissors. Fingernail Test. You can even use your fingernail to test the sharpness of a blade. Start off by wetting a fingernail. It’s recommended to use the thumb nail, as it has a larger surface area. After wetting it, carefully glide the blade over the top of the nail. Don’t apply any pressure, as you’ll risk cutting your nail in half. If the blade is sharp, you’ll see a minimal cut in the nail. A sharp blade will cut it ever so slightly. If the blade just passes over the nail without leaving a mark, it is dull. Once you’ve determined that the blade is dull, you have a few options when it comes to tools. Most commonly, shavers will use a fine grit hone. Barber hones are made specifically for straight razors. They make the process much simpler. They are, essentially, rectangular stones the size of the blade. They come in handy cases to make sharpening as convenient as possible. Alternatively, you can use a fine grit finishing or polishing stone. These stones can be found in craft and hardware stores. They are predominantly used to polish gemstones. They slowly grind away at tough materials, making them perfect for sharpening a straight razor. To make things safer, you should invest in a stone holder. They’ll help avoid cuts to your fingers. You should also use a towel and water tray. 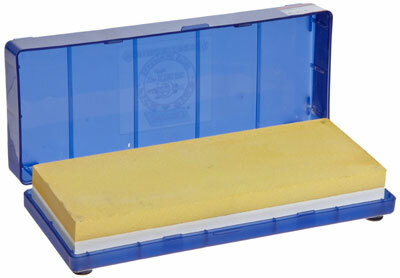 This will help keep the hone or stone lubricated throughout the sharpening process. It’ll also collect any tiny particles you shave off. Additionally, a strop is a great investment. These strips of leather or canvas will help to keep the razor sharp in between honing sessions. The easiest way to get a blade sharp is with a hone. If you’re in the market for a great hone, you can get the Norton 24336 Japanese-Style Combination Waterstone.. 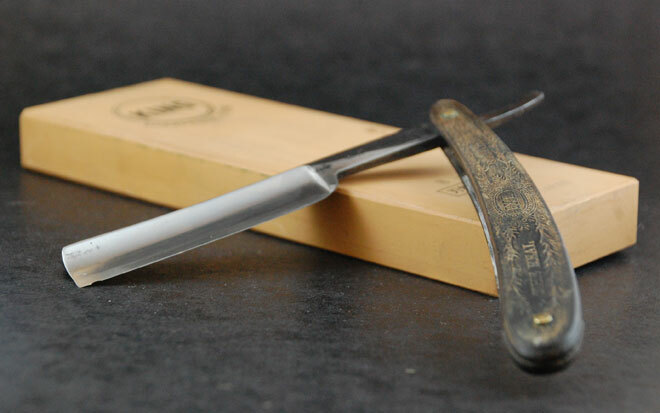 It is perfect for sharpening a straight razor. It is 3 inches long and 1 inch wide, accommodating the size of the blade flawlessly. It has a 4000/8000 grit that’s fine enough for precision sharpening. It also comes in a convenient case that doubles as a holder. You can put the stone in the box’s brackets to ensure that it doesn’t slip. The case itself will keep the stone wet at all times, ensuring that it’s effective through many sharpening sessions. So you’re finally ready to hone the razor! With the proper equipment and safety measures, the process should go by smoothly. Start off by placing the razor flat on the stone. The concave shape with put the razor at an angle. The razor should be placed on the edge of the stone with the sharp side of the razor facing towards the center of the stone. The angle of the razor will ensure that light pressure is being put on the sharp edge. Leading with the heal of the blade, guide the razor across the stone. As you go across the stone, drag the blade slightly downward. You should be moving it at an angle, guiding it downwards so that the entire blade makes contact with the stone on every pass. Flip the blade and go back the other direction, also guiding the razor downward. Essentially, you should be making an “X” pattern as you hone it. Don’t rush the process. Take slow and light strokes to ensure that the entire blade is being sharpened. Consistency and uniformity is key. Rushing it or pushing too hard on the blade will create nicks in the blade that will translate to your skin. Finally, don’t overdo it! Too much sharpening can wreak havoc on your skin. It’ll cause razor burn and rashes. If you think you’ve sharpened the blade enough, perform one of the tests mentioned above. It’ll let you know if you’ve done too much, too little, or just enough. Once the blade is honed, you can continue on with your rugged shaving routine!